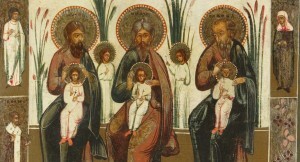 On this Sunday the Church commemorates the Holy Forefathers, i.e. the earthly ancestors of our Lord Jesus Christ, beginning with the first man, Adam, and on through Seth, Enoch, Noah, Abraham, Isaac, Jacob, King David, and others. These ancient people, separated from us by millennia, nevertheless have a direct and close bearing upon us, contemporary Orthodox Christians. What connection is there between them and us? In general, the Church brings them to our attention now, right before Christmas, largely because of their faith – their belief in the promise given by God to Adam during his expulsion from the garden of Eden, that in the end a Saviour will come into the world and will redeem mankind from original sin. All the forefathers – who lived on earth long before the birth of Christ – lived and burned with this faith, never allowing it to be extinguished. They are a shining example to us, who are living on earth after the incarnation of our Lord. 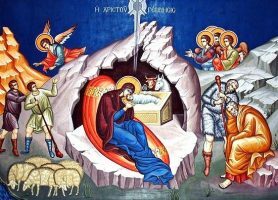 Just like those ancient people we, too, have never actually seen Christ: they only knew that He would come into the world, while we know that He did come into the world. But they firmly believed in His coming and their faith was justified. But apart from faith there is something else that binds us closely with the ancient forefathers – and that is their faithfulness to the awaited Messiah. 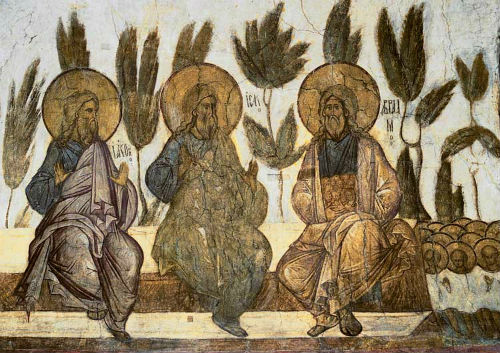 They lived surrounded by a pagan world – a world which did not yet know Christ, but which had already rejected God. We too, dear brethren, live in a similar and even worse situation. For nineteen centuries after the birth of Christ the world lived with Christ and the Christian culture, but in the 20th century an abrupt change took place. We now live in a post-Christian era, in a world that has once again become totally immersed in paganism. We often hear mention of the arrival of a “new age.” However, there is nothing new in this “new age” except for its more modern form. It is the same old rejection of God and even negation of God, and moreover – a complete rejection of Christ and profanation of Christ. Most Christians do not even see how they are perverting their Christian faith in trying to modernize it, and how they are betraying Christ in attempting to unite with the religions of His persecutors and abusers. And so, dear brethren, against the background of this horrifying world, let us remember not only the faith of the Holy Forefathers, but also their faithfulness to Christ the Saviour; and as we prepare very soon to celebrate His Nativity, let us turn away from the paganism that surrounds us, and let us witness our total devotion and loyalty to the One Who said: “Lo, I am with you until the end of time.” Amen.